“I will be a priest someday,” my younger self once said. I can still vividly remember wearing a white rosary wherever I go. It was a dream that left its mark, like a word or sign ingrained in a sword. Seeing a priest donning a white cassock was like a food to my soul. But how hard it is not to be dazzled with material things at our disposal. Even as a child, the idea of becoming a priest started to fade especially when I lost my rosary in the basement, and the introduction of the retro style game called “brick game.” Everyone was crazy about it. Its popularity at the time was unparalleled. In high school, I dreamed of becoming a doctor. A dream whose purpose was not just to cure the sick, but also to get a decent salary that would certainly turn my dull world into a much colorful one. Oh how the lure of money really changed me! How material things distorted my thinking. In my current state, material things still play a very important role. People will do the unbelievable just to get what they want. Remember the Chinese guy who made rounds on social media recently as he offered his girlfriend for rent? The money he’ll get from people who will placed their interest in renting his girlfriend as reported, will be given to the store in exchange of the latest iphone. That is correct. And now I dare you to beat that! Let me know if you can do better than that. Kidding aside, I am hoping this post will serve as a reminder for everyone how powerful material things are. I hope it serves as a reminder to me. If they can corrupt the mind of an innocent child, how much more the minds of the adults? Material things give joy and boost our self-esteem. They give pleasure and happiness. But how long can they make us happy? How happy can they really make us? I am not a hypocrite. As mentioned earlier, I am experiencing and feeling the same way just like anybody else does whenever a new gadget or technology arrives at my disposal. It’s human nature. I feel it. You feel it. Everybody feels it. I’m not so sure when will I kiss the love for new stuff goodbye. I hope I would be able to do it the soonest time possible. I hope everyone would overcome this seemingly endless love for material stuff too. Oh how lovely it is to save richness that can’t be taken away. Richness that won’t be damaged by rust. Richness that will feed the soul. Saving richness that can be rusted and destroyed by time. Richness that are popular today but not so tomorrow. Richness that burn bridges of friendship. Richness that is the root of all evil. If we do the former I am sure after a few years we can look back at the things we did and be all smiles forever. 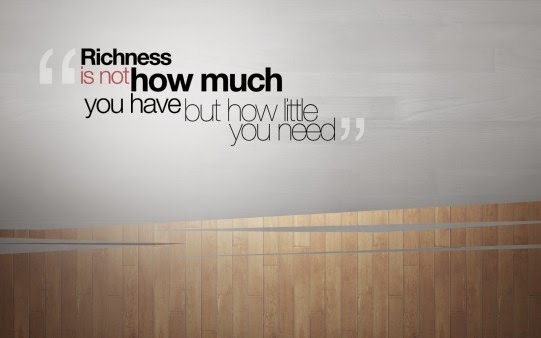 You know what richness to save. Just my two cents this wonderful Monday morning.